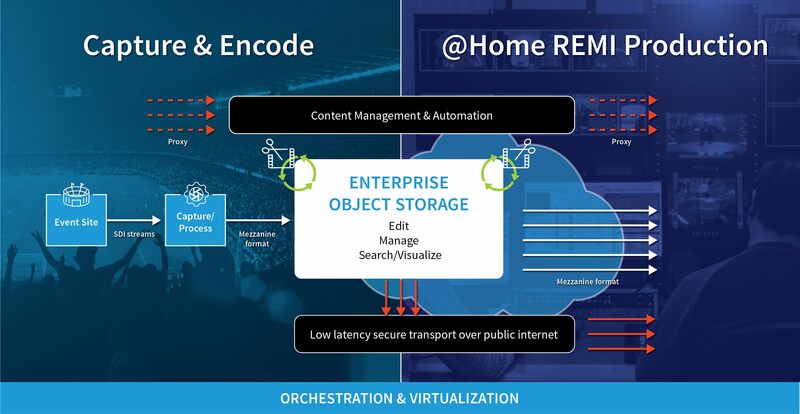 Telestream®, a leading provider of digital media tools and workflow solutions, worldwide IT and networking leader Cisco, and file and object storage solutions provider Cloudian announced they have a collaboration to support “at-home/REMI” production operations with virtualized production workflows. The joint solution, which will be highlighted at IBC 2018, is particularly valuable for organizations seeking to economically execute live remote productions. The integrated workflow allows media production teams to virtualize and automate a huge portion of their remote operations. Customers who engage in any sort of remote production realize meaningful operational savings by leveraging home-base facilities and staff to rapidly produce more content for live, near-live, linear, and on-demand channels. This powerful and sophisticated set of media tools supports 4K/UHD/HDR content ingest, processing and delivery, providing a key differentiator in competitive markets. Strategically integrated cloud capability provides agility and elasticity, allowing users to rapidly deploy and scale up and down as need demands. The Telestream-Cisco-Cloudian workflow highlighted at IBC has incoming SD, HD, and UHD/HDR feeds captured and encoded by Telestream Lightspeed Live and distributed to the content management system for immediate distribution or to Cloudian HyperStore for media storage and collaboration. Telestream Vantage Media Processing Platform and Telestream Cloud support sub-clipping on-site or by remote teams so that production can identify and request specific portions of content they want to work with. Cloudian HyperStore software, backed by the compute and store power of Cisco, provides files on-demand to production teams to act as a limitlessly-scalable, instantly-accessible media active archive. HyperStore provides rapid storage, data protection, search tools and embedded metadata features to accelerate the workflow and facilitate the quick location of assets. This joint solution for virtualized remote production workflows can be seen at IBC 2018 by visiting Telestream stand 7.C16 and Cloudian stand 1.A71. To schedule a meeting, visit www.telestream.net/company/events/ibc/ibc-2018.htm. If any journalists would like to schedule a meeting with Telestream at IBC, please contact one of the PR Team listed below who will arrange for you to meet the relevant company executives.